Tahitian pearls are named for Tahiti an island in the South Pacific French Polynesia chain of islands. This is one the primary regions for farming of Tahitian pearls. Grown in the black lipped Pinctada margaritifera cumnigi oyster, Tahitian pearls are saltwater bead nucleated cultured pearls. 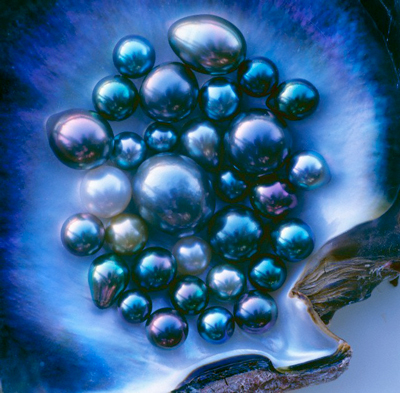 Famous for being “black colored” pearls, Tahitian pearls come in a wide variety of absolutely stunning natural colors including blue, green, grey and silver and more exotic peacock and pistachio colors. These are all natural occurring colors of Tahitian pearls with no treatments or dyes. The culturing process for Tahitian pearls is similar to South Sea pearls with a round bead and a piece of mantle tissue being nucleated into an oyster. Smaller then the South Sea oyster, the Pinctada margaritfera oyster produces Tahitian pearls ranging in size from 8 mm to 17 mm. The majority of Tahitian pearls will fall in the 8 mm to 14 mm range. Their smaller size and cheaper cost of production also means Tahitian pearls are generally less expensive then South Sea pearls. This offers great value for consumers, as high quality Tahitian pearls will have just as good luster, nacre structure and depth of color as the best South Sea pearls. In addition, the variety and uniqueness of pearl colors is something only Tahitian pearls can offer. Indeed, it can be very difficult to find two Tahitian pearls that match exactly in color. For the person looking to stand out from classic white pearls and express themselves, there can be no better choice then Tahitian pearls. Have further questions on Tahitian pearls? Write to us.